The mission to end the deadly Lord’s Resistance Army, or LRA, rebel group is regaining momentum. Offensive operations, which were suspended due to the violent coup in the Central African Republic, or CAR, have restarted. Programs to spur defections are increasing and growing numbers of fighters are escaping from the LRA. The small group of U.S. military advisors sent to boost the counter-LRA mission has had a game-changing impact thus far, reducing LRA attacks by more than 50 percent, and in mid-September, the Obama administration extended the mission into early 2014. Some progress is also being made in the Democratic Republic of the Congo, or DRC, where U.S. advisors are training 500 Congolese soldiers allocated to counter the LRA, though much work remains there. they work together with soldiers, making up the regional A.U. force from South Sudan; the CAR; and the DRC. The advisors’ mission has demonstrated President Obama’s commitment to an atrocity prevention strategy. U.S. advisors and their African partners have made progress in significantly reducing LRA attacks, increasing LRA defections, improving human security and protection for civilians, increasing intelligence collection and analysis, and improving logistics with supply lines. LRA attacks have dropped by 53 percent over the past two years, and LRA killings decreased by 67 percent from 2011 to 2012. At least 31 Ugandan LRA fighters—15 percent of the core fighting force—have defected over the past 18 months. The number of defections this year exceeds those of the previous two years combined. The rebel group is weaker than ever before, and local residents feel safer. Because of this increased security, local communities across the region strongly support the U.S. advisors. Some U.S. policymakers have considered withdrawing U.S. forces from the field and transitioning to a conventional training mission similar to those provided by militaries in other countries and far away from the counter- LRA operations. The hands-on operational support provided by Americans, however, has been a critical component to the success of the mission. Thus the decision not to move to a conventional army training approach far away from the operations was wise, as it would have had a serious impact on Uganda’s mission and given Kony time and space to regroup the LRA once again. The LRA’s numbers are down because of defections, and key commanders have been removed. The LRA’s core senior command structure, however, remains intact. As long as Kony remains leader, he will keep the LRA together with a combination of fear, intimidation, and spiritualism. Under his command, the LRA maintains its ability to regroup, abduct new recruits, and relaunch deadly attacks against civilians. The senior command of the LRA is currently responding to the U.S. deployment by lying low. Their strategy has been to avoid large-scale attacks that would draw attention to the group. They operate in small, mobile groups, and they hide in remote areas. Sources on the ground tell the Enough Project that the senior LRA command could renew attacks if the U.S. advisors leave. 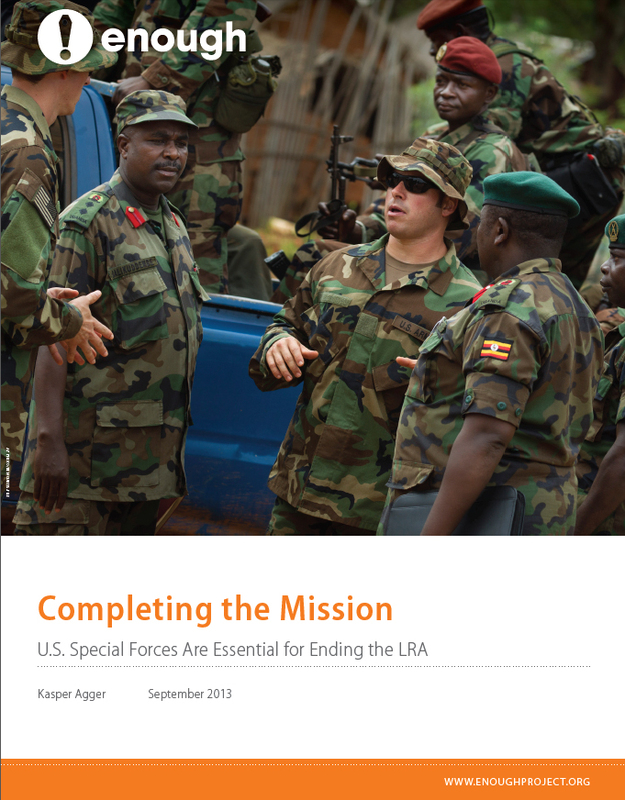 The strong partnership between U.S. advisors and the Ugandan army forms the backbone of the counter-LRA mission, and neither is capable of operating as effectively singlehandedly. Uganda relies on the training, logistical support, and advanced technology provided by the United States, and U.S. troops rely on the Ugandan command structure and the Ugandans’ experience addressing the LRA issue, as well as their ground presence and knowledge of the terrain. Removing one partner would significantly weaken the efforts of the other, undermining the entire counter-LRA effort and allowing the LRA to rebuild its forces and threaten the safety of civilians.